ArduBlock is a programming environment designed to make physical computing with Arduino easier for beginners. Instead of writing code, worrying about syntax, and (mis)placing semicolons, ArduBlock allows you to visually program with a snapped-together list of code blocks. Note for Educators: You will most likely need to obtain administrative privileges from your network or IT administrator in order to install software and drivers. We recently discovered that ArduBlock is not compatible with the latest release of Arduino. It does work with Arduino 1.6.11 and below. 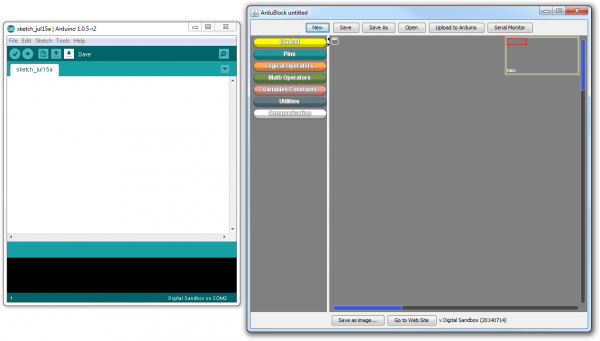 ArduBlock is an add-on to Arduino, so you'll need to have the Arduino IDE installed. Since Arduino is multi-platform -- ArduBlock will also work on Windows, Mac, or Linux. If you already have Arduino installed on your system, skip ahead to Installing ArduBlock Only. The Arduino software comes packaged in an archived, .ZIP format. Once you've downloaded the ZIP file, you'll need to extract it. Both Windows (use the built-in extract wizard) and Mac (double-click to open) machines should have built-in tools for unzipping. Mac users can simply run the Arduino application from the extracted folder, or move it into a preferred directory (e.g. Applications) and then run it. Also move the Digital Sandbox Examples folder to your preferred location. 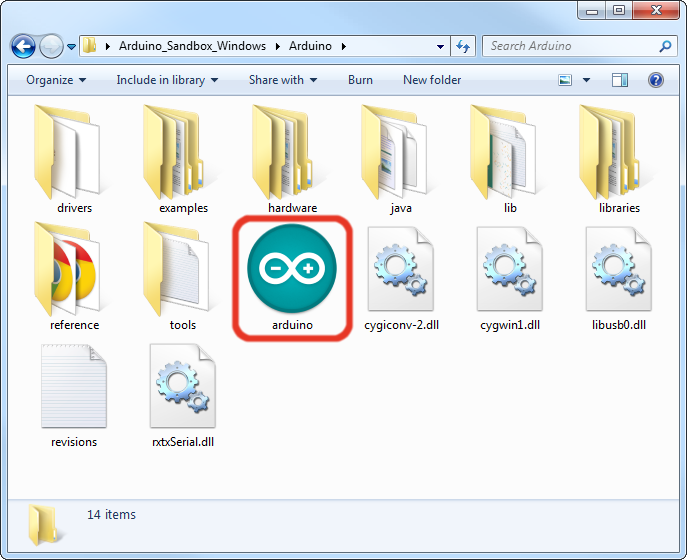 Windows users can move the Arduino folder to a preferred location. Digital Sandbox examples are included as well, in a folder named "Digital Sandbox Examples." Note: The addon in the link above will only work with Arduino versions 1.6.0 and up. 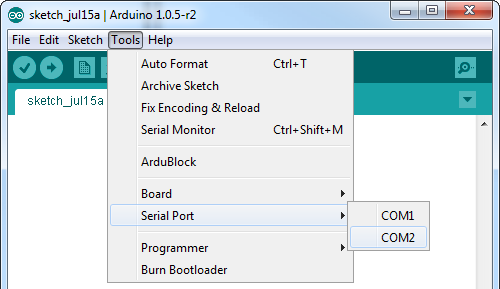 If you're using an older version of Arduino (1.0.6 or earlier) download our previous version of the addon instead. The installation directions will be the same. All of the add-on items are archived in a ZIP folder. To install the addon extract the ZIP file into your computer's Arduino sketchbook directory. This is a folder on your computer where your sketches and libraries are saved by default. To find your sketchbook location, run Arduino, and open Preferences by going to File > Preferences. The contents of the top text box defines your sketchbook location. Memorize that location and close Arduino. Then extract the contents of the Sandbox_Addons.zip file into that location. Once you have downloaded and installed any necessary software and add-ons, you will need to connect an Arduino board to your computer to install drivers. This may happen automatically on some systems, but if not, here is a resource for installing drivers manually. Since ArduBlock is an add-on to Arduino, first we'll open the Arduino program. Windows users should run Arduino.exe; Mac users can click on the Arduino application. You will also need to connect an Arduino board to your computer at this time. Let's do some preparation before opening ArduBlock. First, go to the Tools menu, hover over Board and select the board being used. These screen grabs show the Digital Sandbox as an example. Next, go back to the Tools menu, hover over Serial Port and select the serial port number connected to your board. Windows users: This is likely to be COM2 or higher (COM1 is usually reserved for hardware serial ports). To find out, you can disconnect your Arduino board and re-open the menu; the entry that disappears should be the board. Reconnect the board and select that serial port. Mac users: On the Mac, this should be something with "/dev/tty.usbmodem" or "/dev/tty.usbserial" in it. Finally, to open ArduBlock, go to Tools and select ArduBlock. This will open the ArduBlock interface. Make sure the Arduino window remains running in the background. If you close that, ArduBlock will close as well. Note: If you don't see ArduBlock under the Tools menu, revisit the Checklist and check that it was installed correctly. Now that ArduBlock is successfully installed, here are some tutorials to get you started coding with blocks. 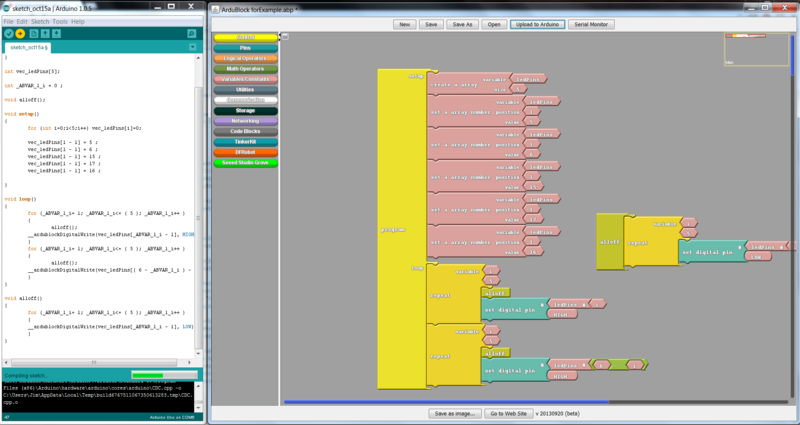 ArduBlock is a great way to introduce programming with our Digital Sandbox and ProtoSnap series.